may you, too, respect the men who make and manipulate them. Among the collection’s holdings were the kinds of photographs publicity departments used to dispel the notion of the soulless corporation and at the same time encourage workers to view themselves as vital parts of a meaningful whole. 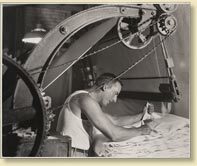 Photographers like Lewis Hine shifted emphasis to heroic depictions of workers. “I thought I had done my share of negative documentation, and I wanted to do something positive,” he wrote. 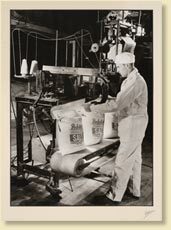 Individual portraits created by Hine and others illustrate employees handling tools and machinery with focused intensity and skill—classically composed photographs that projected a message of employee pride within a smoothly functioning corporate family.